For the last ten plus years, advocates of a two-state solution in Israel/Palestine have been warning that the “window of opportunity” for a two-state solution is closing fast. Secretary of State Condoleezza Rice said yesterday that a “two-state solution” in the Middle East is in jeopardy and described a narrow window of opportunity to push Israel and the Palestinians toward peace. The window is closing on a two-state solution, and Israel’s prospects for a second, safer 60 years grow are growing ever dimmer. If this round of talks breaks down yet again – and you’ll be hard-pressed to find a single observer who’ll argue that they won’t – then Israel, like the boater on the river, can briefly revel in having avoided the risk of heading to shore. But bear in mind that “sitting this one out” isn’t an option. The waterfall is still dead ahead. As someone who’s invoked the “closing window” more than once myself over the years, I’m quite familiar with this pedagogy. Time is running out for a viable negotiated two-state agreement between Israelis and Palestinians – and thus the future of a Jewish and democratic state. 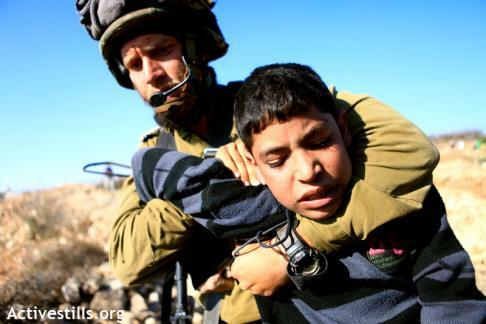 The status quo – namely unrestricted Israeli settlement of the West Bank, coupled with an ever-increasing Palestinian birth rate – simply cannot be sustained. At a certain point, however, I think it’s fair to pose the challenge: how many times can you repeatedly warn of a last chance before the notion is rendered devoid of all meaning? How long can advocates of a two-state solution invoke the urgency of a fleeting opportunity before admitting that this solution is simply no longer a realistic option any more? Such a position, of course, makes a complete mockery of any suggestion of a viable, contiguous Palestinian state. It lays bare the truth that Israel is not really interested in two actual states, but merely the formalization of an inherently inequitable status quo. So what happens now? It’s reasonable to assume that this paralyzed, inequitable status quo will continue apace into the indeterminate future. Israel will continue to create facts on the West Bank with the tacit permission of the US, creating a conditions that no Palestinian leader could possibly be expected to accept. Under such circumstances, it is equally reasonable to expect the reality for Palestinians on the ground to grow increasingly oppressive and dire. As this occurs, their plight and their cause will be more difficult for the world to ignore. Governments, individuals and institutions will increasingly rally to Palestinian requests for support, most prominently the Palestinian civil society call for Boycott, Divestment and Sanctions against Israel. In turn, Israel’s actions will be increasingly more difficult for its supporters to defend. As the status quo is allowed to languish, the state of Israel will become further and further isolated from the rest of the world community and more pressure will be brought to bear upon the political elites to fundamentally change their approach to ending this conflict. While these are certainly sobering and painful prospects, I don’t think they are exaggerated or far-fetched. On the contrary, I believe the burden of proof is on those who believe the same tired approach to the “peace process” will somehow yield results in the future when it has failed repeatedly in the past. Once we accept that a division into two states is no longer realistically possible, the calculus is sobering, to put it mildly: we will be forced to choose between a patently undemocratic apartheid Jewish state, in which a minority rules over a majority or a civil democracy in which all citizens have equal rights under the law. For many liberal Zionists, this unbearably painful decision will represent a profound moment of truth. If forced to choose, which will it be? A Jewish state that parcels out its citizens’ rights according to their ethnicity – or a democratic state in which equal rights are enjoyed by all its citizens? I truly believe this is more than an academic question. Perhaps it’s time to stop talking about mythic “windows of opportunity” and open a new discussion: what will it take for us to admit that it is finally closed? And what will our options be then? This entry was posted in Civil Rights, Coexistence, Israel, Palestine, Peace, Peace Process, Politics, Zionism on February 1, 2012 by Rabbi Brant Rosen. Last Thursday, Ta’anit Tzedek hosted a fascinating, stimulating conference call with Palestinian-American journalist Ahmed Moor. Moor, who was born in Gaza, has reported from Lebanon and Egypt and is currently a graduate student in public policy at Harvard. He has been an outspoken advocate of a one-state solution in Israel/Palestine – and during our conversation he elaborated extensively on a subject not commonly countenanced in the American Jewish community. We recorded the call and will be posting it on our website soon. In the meantime, I’ve transcribed portions of our conversation and have posted them below. Personally speaking, I find Moor’s way of thinking to be fresh and important and I believe these kinds of ideas deserve a fair hearing in our community. First I want to address this idea that a Jewish state has a right to exist because Jewish culture is valuable. Jewish culture is valuable. Hebrew culture is valuable. It is intrinsic – that’s true whether or not Newt Gingrich thinks it’s invented. But the question of whether culture needs to be mapped on a geographical space in a state environment, I think, is one that is open to discussion. And so when we think about Jewish life here in America, I don’t know that many people would disagree with me when I say that some of the most vibrant examples of Jewish life are here in America, in the diaspora, amongst non-Jewish people. So right-wing Israelis like to make the argument that where Hitler failed, assimilation is going to succeed. Intermarriage is the biggest threat to the Jewish people, not Iran. Well, if you believe that Israel is the homeland of the Jewish people and that it’s the only state guarding Jewish culture, well then you are in a sense aligning yourself with those arguments. It’s illiberal, fundamentally illiberal. We know from American experience that a multiplicity of cultures can exist alongside one another and engage with one another and strengthen one another and maybe, even yes, impact one another in positive ways. Well, that’s unfair. No matter how much you value Jewish culture, and no matter how much you believe Israel needs to exist for the preservation of Jewish culture, if it’s a museum, which I don’t think it is, you’ve got to realize that your cultural progress is coming at the expense of somebody else’s freedom. And I think that there’s an asymmetry there in what matters. I think that first we’ve got to look at the reality today. The status quo is about expelling Palestinians from Jerusalem, their land in the West Bank, and disenfranchising them in greater ways in Israel proper…So the reality is exactly the opposite. The status quo, the two-state solution process, is about pushing the Palestinians not into the sea, but in the other direction. Do you ever believe as American people that there’s ever going to be something like Kristallnacht or a pogrom targeting the Jewish people in America? If the answer is yes, well then perhaps it’s time to move to Israel – and that’s what most right-wing Israelis say. If the answer is no, well then you’ve got to realize that you are opting for the preservation of an insurance policy, but the price of that insurance policy is being borne by another people. The Palestinians are paying the cost of a Jewish American insurance policy. There’s that asymmetry again. That doesn’t work. That’s not a moral position to take and it’s unsustainable. As for Israelis’ fear about whether we seek to ethnically cleanse them, I think there’s again a gap in perceptions of realities. The Israelis are the ones with the guns. The Israelis are the ones with the American support. When the one-state solution is actualized, it’s going to be necessarily through Israeli consent. The idea that the Middle East or Palestine has to be in any way ethnically cleansed of Jewish people is a European action transplanted onto Palestine. Gershon’s fear is related directly to governmental structures – the way in which you structure multi-ethnic, multi-religious societies, or sectarian societies. In Lebanon I think it was structured exactly the wrong way. In Lebanon, whether you’re liberal or you’re somebody who’s more conservative, whether you believe in one policy versus another, the state almost compels you to vote along sectarian lines. In Lebanon the Speaker of the Parliament has to be a Shia Muslim, the Prime Minister is a Sunni and the President has to be a Maronite Christian. That’s constitutionally true – that’s mandated. And so what that means is that you end up voting – where your vote is impactful and meaningful – is in your sectarian group. The Lebanese demography there is so sensitive – they haven’t had a national census since 1932 or 33, I think. You have the American case, on the other hand – the structure of this country is along a federal basis. Federalism enabled this country to recover from the wounds of the Civil War and to persist for another 150 – 160 years since the Civil War ended. It’s important that we think about questions like the ones Gershon is raising, but I don’t think that those questions necessarily stand in the way of a one-state solution. So there are good federal structures, confederal structures even, for dealing with ethnic or religious strife in democracy. What I’m thinking of specifically is a state with four federal units: the Gaza Strip, Jerusalem is its own district, sort of like Washington DC, central Israel and the Negev and finally the West Bank and the Mediterranean corridor so now you’ve got four districts and Jerusalem. And each of those federal units would be defined geographically and every one of them, with the exception of the Strip, would be made up of minorities either of Jewish people or Palestinian people. And so in the West Bank federal state you’d have an expression mostly of Palestinian culture. Why? Because 5 out of every 6 people on the West Bank are Palestinians. In the Gaza Strip you could have an expression of Palestinian culture. In the northwestern state there’s a big minority of Palestinian Israelis, but it’s primarily Jewish. I mean we’re talking about the Tel Aviv – Haifa corridor and that would be a majority Hebrew culture state. Same with the Negev. So you have parity amongst the states because the states are defined geographically and you enable people over time to move for personal preference reasons. Over time your could get a drift across these federal lines, kind of like what happened in the States. You used to define yourself as an American 100 years ago as a South Carolinian or a New Yorker, but today your primary locus of identity is as an American when you deal with the rest of the world. This was the failure of Lebanon – instead of geographically defining the states, the individual community boundaries within Lebanon don’t allow for that drift, so what they’ve ended up with is kind of ossified sectarian structure. So I don’t think it will be perfect, I don’t it will be easy, but the idea is that you grant people equal rights and give them the freedom to move back and forth across borders. They won’t initially, but they will eventually. That’s been the American experience. I heard an Israeli speak recently, an older guy, an activist, and he mentioned the one-state solution is about where he remembers the two-state solution was in the seventies. And so it’s really about changing discourse, changing people’s thought patterns. Lots of people will come into the one-state conversation because they’ve realized the two-state solution is unworkable and that apartheid is just not something they are capable of supporting. We’ll achieve a critical mass. It’s impossible to predict how or when, but two states isn’t going to work and apartheid isn’t going to work. And so you can arrive at this position by default even if you don’t actually believe it’s the best thing anyway. People talk about a unitarian model where it would be just one man/one vote and I think that’s a great model to think about. My biggest concern there would be preservation of cultural autonomy, which I think many people at this stage really, really value in that part of the world. Palestinians don’t want to give up what it means to be a Palestinian and I think Jewish Israelis have developed a Jewish kind of culture. I don’t know whether its an Ashkenazic culture or a Sephardic culture, I don’t know. It’s not for me to decide. But there is an Israeli culture and I think those people want to preserve it. And when American Jewish people talk about Jewish culture in Israel, that’s something they’d like to be capable of accessing. And so I’m concerned that the unitary system may not permit the kind of cultural autonomy that many people would like. But we’re still in the early stages of imagining what it could look like and the question of how to get there really does hinge on people of good will standing up and saying no to apartheid. The right of return today for the Palestinians is actually about the right to be able to go back and live in Palestine. Lots of people still remember native villages which no longer exist, so the practicalities of it are difficult to map out. The right of return for the diaspora is more about, I think, official recognition of the ethnic cleansing of Palestine in 1948 and in the period leading up to May 15 1948. It’s an official apology, reparations where appropriate and possible and just recognition. And I think the Jewish people probably understand this better than anybody. Once a historical injustice has been done to you as a people, recognition matters. Apologies matter. Reparations matter. Even symbolic measures matter a great deal. Who do I believe will return to Palestine? I think most of us will not. The Palestinians in the diaspora have done pretty well for themselves. Palestinians in Jordan have done pretty well, the ones in Western Europe, in Latin America, in Northern America are doing pretty well. I think you could draw a direct analogy to the Jewish American diaspora. You want to go you want to visit, you want to go and hang out on the beach and go home to where you’re from. The only missing group of Palestinian refugees who will actually return to Palestine if they have the opportunity are the 300,000 or 400,000 Palestinian refugees who live in Lebanon. Their lot really is very, very poor and the Lebanese state is racist in many ways in the way they interact with Palestinians there – it’s inexcusable, but that’s also the reality. And given the opportunity I think many of them will leave their squalid and impoverished camps and return to Palestine. But everywhere else, I think you’ll get kind of a vibrant interaction with a diaspora community and the country itself, which I think mirrors, in many ways, the Jewish experience. This entry was posted in Civil Rights, Coexistence, Gaza, Holocaust, Human Rights, Israel, Jewish Fast for Gaza, Palestine, Refugees, Zionism on December 18, 2011 by Rabbi Brant Rosen. This entry was posted in Children's Rights, Coexistence, Human Rights, Israel, Nonviolence, Palestine on February 24, 2011 by Rabbi Brant Rosen. Friday began with a trip to Jaffa – once a thriving Arab port city, now part of the Tel Aviv municipality. Jaffa was emptied of its residents in 1948 and today “Old Jaffa” is has been turned into a quaint artist’s colony. For most tourists who frequent Jaffa’s galleries and restaurants today there is little indication of the rich Palestinian cultural history of the city. And even fewer have any idea that there is a Jaffa slum neighborhood, Ajami, which is populated by internally displaced Palestinians and their descendants. 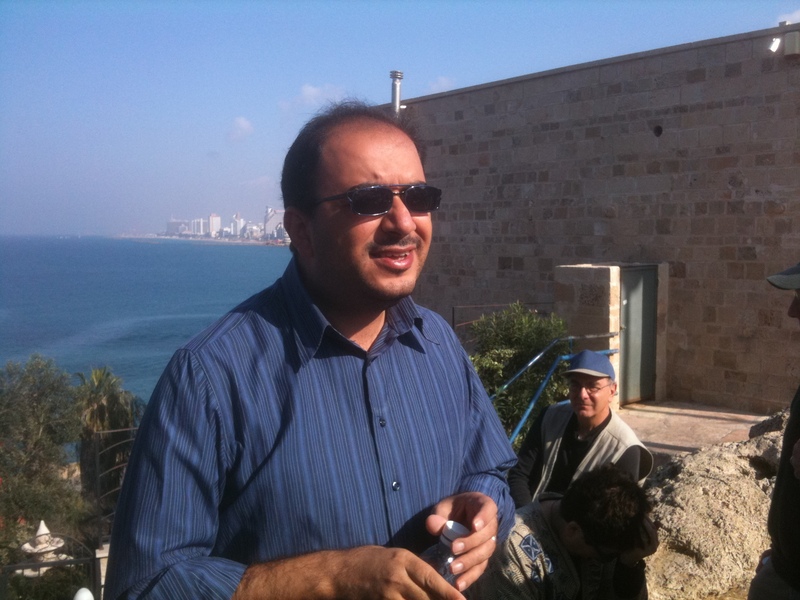 Our tour of Jaffa was led by Sami Abu Shehadeh (above), a Jaffa historian and community activist who was recently elected to the Tel Aviv/Jaffa city council. 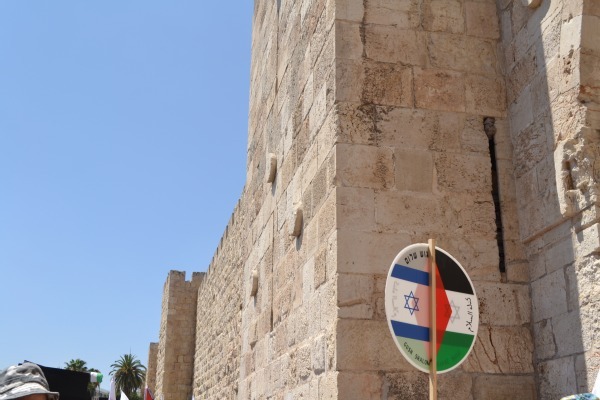 Sami began by explaining Jaffa’s history as port city and by recounting the long line of occupying forces that have left their mark on the city over the centuries. He then gave us a view into the Palestinian life of a place that only exists today in vestiges: a mosque that is now a fish restaurant, Arab homes that have been converted into stores and high scale art galleries, etc. Our tour of Ajami was also intensely eye opening. Sami described how in 1948, the majority of Jaffa’s 100,000 Palestinians were expelled or fled in fear for their lives, crowding onto ships that took them to refugee camps in Gaza and Lebanon. 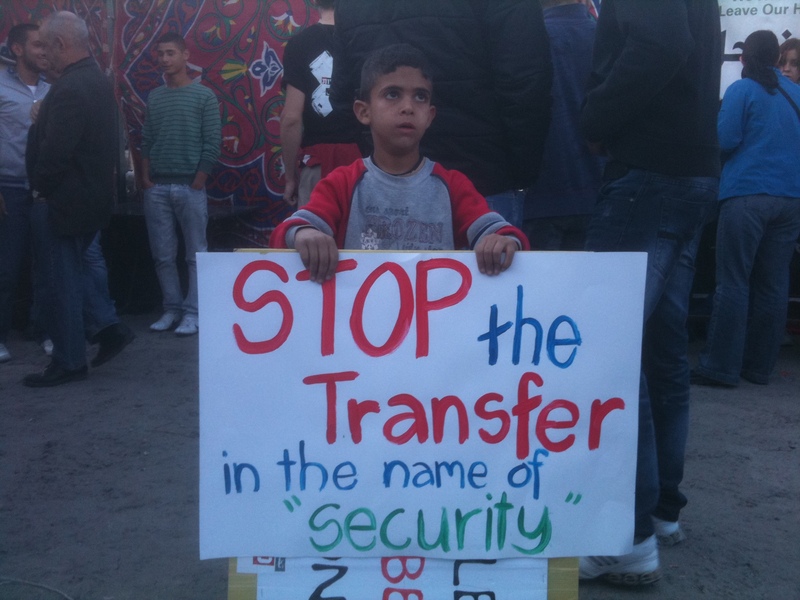 Others traveled by foot to camps in Nablus or Jordan. The remaining 4,000 were rounded up and brought to Ajami, which was literally turned into a ghetto surround by fences and guard dogs. Sami said that his own grandfather, who used to be able to drive from Jaffa to Beirut, needed military permission to leave the neighborhood. According to Sami, the trauma experienced by the Palestinians of Jaffa was really threefold. The first was the total destruction of their social reality as a result of their expulsion from their homes and the lives that they had known. The second trauma was economic: after their expulsion, the new Israeli authorities passed the Absentee Property Law of 1950, by which it could “legally” seize their properties. In many cases, these “absentees’” homes were their taken from them while they lived just a short distance away in their new ghetto. The third stage of trauma Sami called “coexistence.” After the expulsion of Palestinians from their homes, the new State of Israel began absorbing thousands of new Jewish immigrants from around the world by placing them in seized Arab property. When all of the homes in Jaffa had been occupied, the Israeli housing authorities began dividing the homes in the Ajami ghetto into apartments and housed Jewish immigrants together with Arab families. Imagine, Sami said, if you were forced to live together with the very people who were now serving in the army, and quite possibly going own to kill your own family members in Gaza or Nablus before returning home to live with you under the same roof. Our tour of Ajami also included a neighborhood that was undergoing heavy gentrification, with multi-million dollar beachfront homes, renamed by developers “North Ajami.” Sami pointed out the irony that many of these rehabbed Arab houses used to be home to poor fishermen who lived near the coast – and are now inhabited by embassy workers and billionaire businessmen. Later in the afternoon, our group attended a demonstration in Silwan, the neighborhood in East Jerusalem that we visited on Wednesday. There have been weekly demonstrations held in the East Jerusalem neighborhood of Sheikh Jarrah every Friday for almost two years to protest the ongoing evictions of Arab residents and occupation of their homes by Jewish settler groups. The Sheikh Jarrah solidarity movement sponsored Friday’s protest in solidarity with Adnan Ghaith, a community activist from Silwan who was recently handed a court order expelling him from Jerusalem for four months. 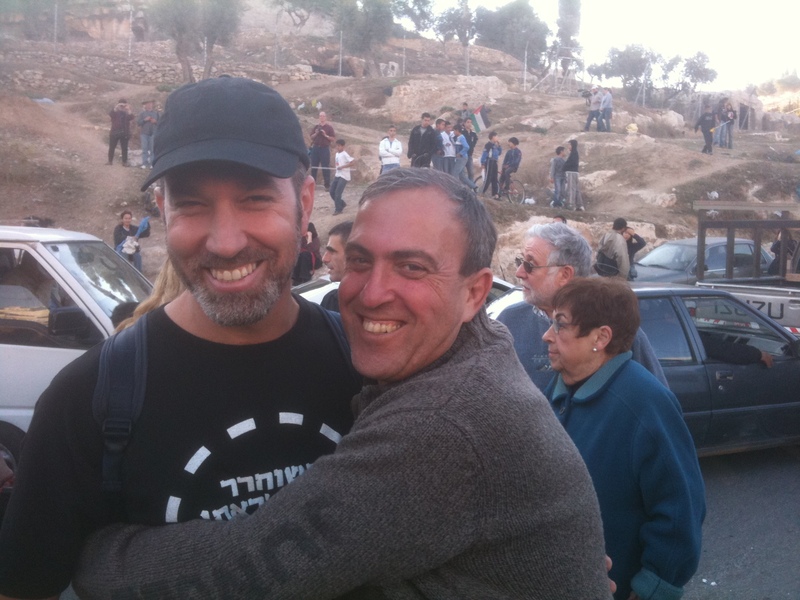 At the protest, I had the pleasure of running into peace activists Yonatan Shapira and Rami Elchanan (below). 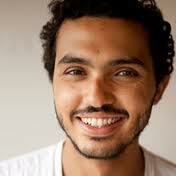 I met Yonatan last May when he visited Chicago and his activism has since become a huge source of inspiration to me. Both Yonatan (right) and Rami recently participated on the latest flotilla of boats attempting to break the siege of Gaza by bringing symbolic amounts of humanitarian aid to its citizens. (Click here to read more about their experience on the flotilla). On Shabbat, Rami came to our hotel in East Jerusalem to speak together with our tour guide Aziz about their work in the Bereaved Parents’ Circle. I’ve written a great deal about this organization over the years, which I believe to be one of the most important peace and reconciliation groups in Israel/Palestine. Rami, who lost his fourteen year old daughter to a suicide bombing and Aziz, whose older brother died after being tortured in an Israeli prison as a teenager, both spoke movingly and openly about their pain, the anger, and their personal transformations as a result of their work in this amazing organization. Later in the afternoon, we heard a presentation by Israeli journalist Orly Halpern, who, for my money is one of the gutsiest and most intelligent reporters on the Mideast conflict. Her talk on the pragmatism of Hamas was eye-opening to say the least. (And she did it all with her three month old Adam in a Snugli…) Check out Orly’s blog here. This entry was posted in Coexistence, Human Rights, Israel, JRC I/P Study Tour 2010, Nonviolence, Palestine on December 27, 2010 by Rabbi Brant Rosen. 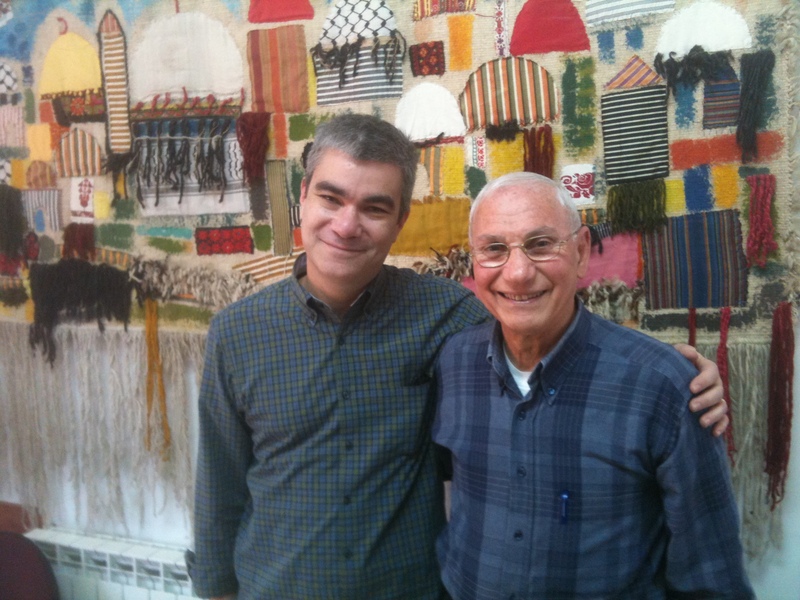 Our Wednesday began with a visit with Reverend Naim Ateek (above), founder and head of Sabeel, a well-known institute that advocates Palestinian Chrisitian Liberation Theology. As readers of my blog might know, I’ve long been an admirer of Reverend Ateek’s theological writings. In particular, his work has informed and challenged my own thinking about the Jewish conception of the land and the dangers inherent in wedding religion to power. It was a great pleasure to finally meet Reverend Ateek personally and to introduce him to members of my congregation. 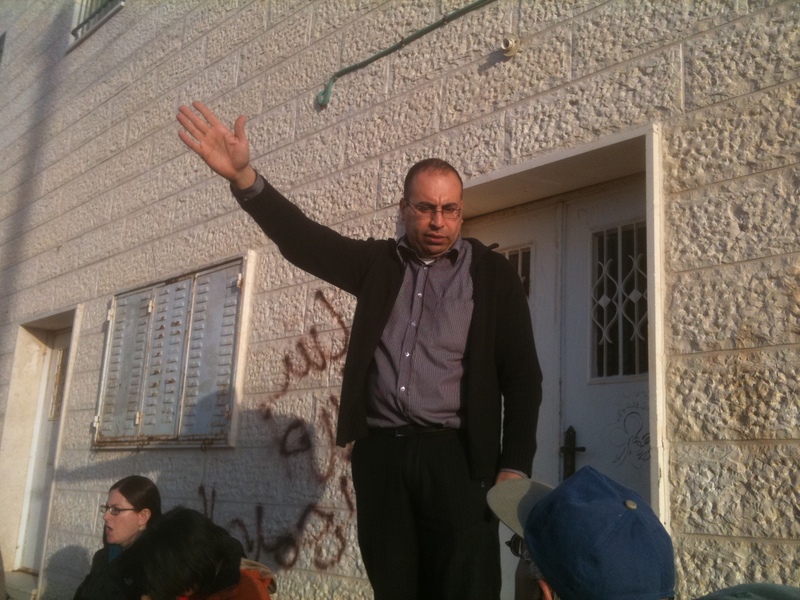 To my dismay, Ateek has been unfairly and relentlessly attacked by the American Jewish establishment – largely, I believe, because he does not shrink from illuminating the problems that come with the land-centric nature of Zionist ideology. For myself, I’ve learned much from Ateek’s suggestion that Zionism represents a kind of “Constantinian Judaism” – i.e., a fusing of Judaism with Empire. Whether or members of the Jewish community agree with him or not, I believe it would greatly behoove us to enter in dialogue with Ateek and others in the Palestinian Christian community – and I told him as much during our meeting. At the very least, it is my sincere hope that there might be Jewish leaders actively participating rather than protesting during the next American Friends of Sabeel conference. 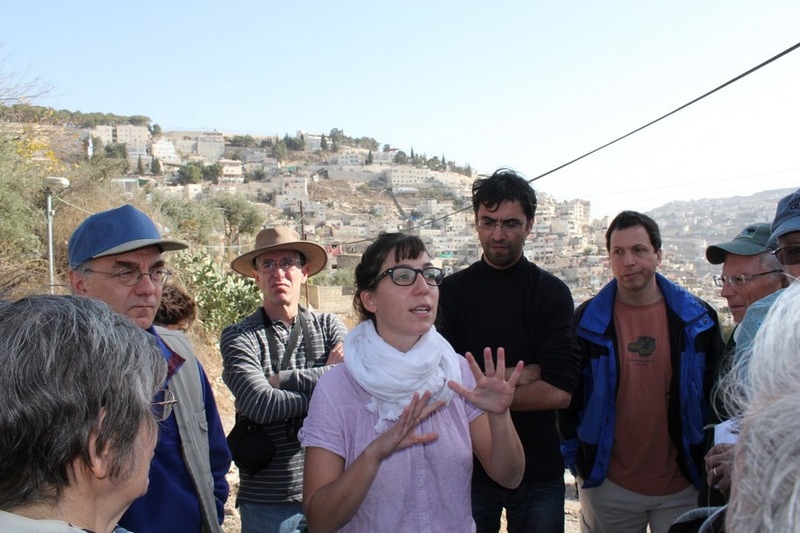 After our visit we were joined by Meirav Zonsztein, (above) an Israeli/American journalist/blogger/activist, who led us on a tour of East Jerusalem. We first stopped at Gilo, a prominent development located east of the Green Line southwest of Jerusalem. Gilo is emblematic of a settlement considered by most Israelis to be part of the Jerusalem municipality, but its ongoing expansion has been severely encroaching upon Palestinian neighborhoods in the area. Gilo is but one of Israel’s many settlement projects that renders a viable, contiguous Palestinian state that much more remote. We also stopped at Silwan, an Arab neighborhood located alongside the City of David outside the Old City. Silwan is currently the focus of a bitter struggle between Palestinian residents and an Israeli government that seeks to create a greater Jewish presence in East Jerusalem. In this case, the attempt to drive Arabs from their home is occurring under the guise of Israel’s historical “claim” to Biblical Jerusalem. What makes this situation particularly galling is Israel has handed over the management of the archeological excavations to Elad, a private Jewish organization that seeks to “reclaim” Biblical Jerusalem in order to pave the way for the rebuilding of the Third Temple. Most visitors to the City of David excavations have no idea that their entrance fees to this popular tourist site fund this religiously radical organization. The plans call for the demolition of 22 houses in the area, which the city claims were built without the necessary permits. (Ironically, the illegally constructed multi-story Beit Yonatan which towers above the overcrowded hovels of the village has not yet been evacuated and sealed, in defiance of a court order.) Few people are aware that the residents of Silwan, at their own expense, sought professional experts to draw up a plan which would enable them to engage in the kind of urban renewal that has taken place in other hitherto neglected areas of the city…The Jerusalem municipal authorities arbitrarily rejected the plan without even bringing it before the relevant planning forums. Our group will return to Silwan this Friday to attend a major protest organized by the Sheikh Jarrah solidarity movement. We then traveled into the West Bank to visit Wadi Fukin, an Arab village just east of the Green Line in the Gush Etzion bloc. In recent years, Wadi Fukin has been threatened by Israel’s planned construction of the Separation Barrier, which would cut off the village’s water source from numerous natural springs that the villagers use to irrigate their fields and orchards. In a particularly inspiring example of coexistence and solidarity, the residents of Wadi Fukin were joined by residents of the nearby Israeli village of Tzur Hadassah in fighting the planned construction. Through a massive petition drive signed by hundreds of Israelis and Palestinians, Israel has for now forgone its plans to construct the wall – one of the very few success stories of its kind. In the meantime, however, Wadi Fukin’s future is also being threatened by the expansion of nearby settlement Betar Illit. Ongoing construction of this populous and rapidly growing ultra-orthodox development is literally encircling the village and would likewise dry up Wadi Fukin’s freshwater springs. To add insult to injury, Beitar Illit regularly dumps its sewage into the village’s water supply, despite the repeated protests of village residents. Despite these horrid hardships, Wadi Fukin is forging on with the help of Friends of the Earth -Middle East, an environmental NGO that has included the village in its “Good Water Neighbors” project. That’s Iyad Aburdeineh below, project co-cordinator of FOE-Middle East Wadi Fukin initiative, who led us on a tour of the village. While in Wadi Fukin, our group was treated to a delicious lunch cooked for us the staff of the village’s Women’s Center. In all, it was impossible for us to be unmoved by the story of the village, one inspiring success story amidst an increasing dire situation in the Occupied Territories. 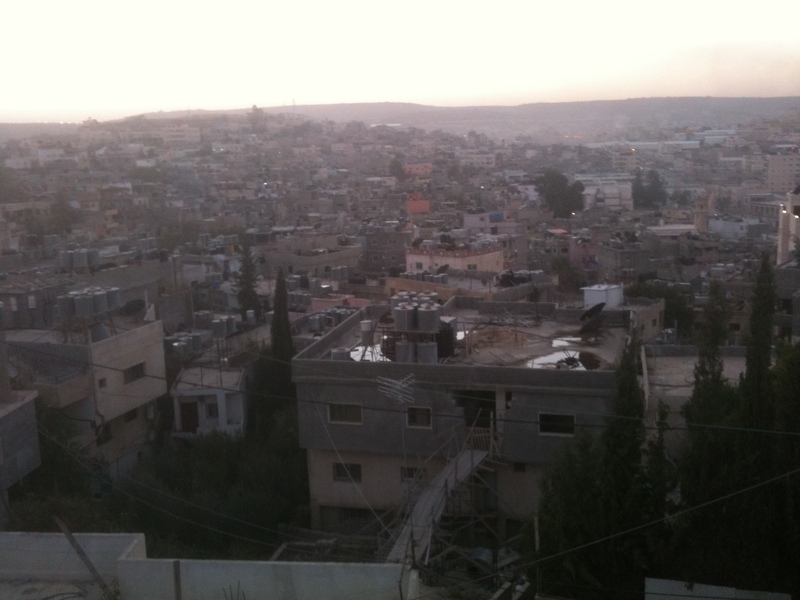 From there we traveled to Deheishe, a refugee camp near Bethlehem. Deheishe (below) was established as a refuge for 3,400 Palestinians who were expelled from 45 villages west of Jerusalem and Hebron in 1948. Originally simply a collection of tents, Deheishe is now a densely packed urban labyrinth of over 9,000 residents. Adminstered by UNRWA, the camp is bordered to the north by the Jewish settlement of Efrat and to the south by Bethlehem. Like many Palestinian refugee camps, Deheishe has nowhere to grow but up – most of the homes have three stories and the camp seems to be in a constant state of vertical expansion. Upon our arrival we were greeted by Deheishe resident Mazen Faraj, who coordinated our visit and introduced us to our host families. My group of seven was hosted by Nidal and Newarah and their three children, Haya, 18, Moad 17, and Tariq, 12, who opened their recently built home to us and were utterly gracious hosts to our intrepid little crew. They treated us to a delicious – actually sumptuous – dinner and we enjoyed each others’ company talking, sharing and laughing until the wee hours of the morning. I spoke at length with Moad, who at one point took me out for a long night stroll through the winding alleyways of the camp, introducing me to friend after friend until it felt like I had met virtually the entire teenage population of Deheishe. After coming home, we continued to talk together as neighbors came and went through their home at a dizzying pace. For right now, I don’t really know how else to describe our visit other than a genuinely delightful evening with wonderful new friends. I’ll share many more thoughts about our Deheishe soujourn in my next post. For now, suffice to say it today was an incredible journey for us all – and it has only been our second full day. This entry was posted in Coexistence, Interfaith, Israel, JRC I/P Study Tour 2010, Palestine, Refugees, UN on December 24, 2010 by Rabbi Brant Rosen. Ma’an News Agency recently did a feature on Haim Bajayo, a 75 year-old Israeli who has family roots in Hevron. Bajayo recently met with Hevron Mayor Khalid Al-Useili, initiating what can only be described as a personal gesture of reconciliation. Bajayo told Mayor Al-Useili that he was born in Hevron in 1935 and grew up in its Daboya neighborhood. His family held official property documents until 1977, at which time he offered up his home to the Palestinian municipality. He stated at the time that as long as there were settlers in Hevron, there would be no chance of a peace agreement. The meeting ended with Bajayo requesting that after death his body be buried in a Muslim cemetery in a show of respect to the history of his family which once lived in peace with its Arab neighbors in the city. “I want to be buried in Hebron. I won’t go to a Jewish cemetery at any rate, because it’s under the settlers’ control. I’m requesting a modest burial spot in a Muslim cemetery,” he explains. Just a simple human encounter. Might it offer us a model of a larger gesture of reconciliation between Jews and Palestinians? Bimheyra beyameinu – May it come speedily in our own day. This entry was posted in Coexistence, Human Rights, Israel, Palestine, Peace on July 6, 2010 by Rabbi Brant Rosen. Update: Good News From Tent of Nations! Our Lawyer appealed to the Israeli Supreme Court to stop the demolishing of our renovations which is planned to take place this coming Sunday or Monday. I believe, because of all the pressure and the reactions from all of you through writing letters to your governments and to the Israeli officers, the Supreme Court of Israel granted an injunction to stop the military from taking any demolishing actions until the Supreme Court takes a decision. The military authority was given 60 days time to send their objection to the Supreme Court. This means that we will have to go for a trial in the Supreme Court. We, and with all your prayers and support and with the help of your advocacy letters, managed to freeze the demolishing orders and to bring this case to the Supreme Court. It is a victory for justice even if it is a small one for now but it is a victory. I want to thank you for all your prayers, for the many E-mails we received from you and for the solidarity visits. I will keep you updated about the development of this case in front of the Supreme court. Our efforts together made a difference. This entry was posted in Coexistence, Human Rights, Israel, Nonviolence, Palestine, Peace on June 3, 2010 by Rabbi Brant Rosen.